Charles Darwin in Avonmouth Docks, being readied for a research cruise. Displacement: 2,556 tonnes, fully loaded. processing systems: Simrad EM 12S 120 and EA500 echo/sonar; multiple GPS systems; Bridgemaster ARPA C342/6 and C252/6 radar. RRS Charles Darwin was built in 1985 by Appledore Shipbuilders in Devon. Named after the eminent English naturalist, she was used primarily for research in oceanography, geology, and geophysics. After 21 years of service, Charles Darwin was retired in June 2006, and replaced by the RRS James Cook. Purchased by Gardline Marine Sciences Limited of Great Yarmouth, she was renamed RV Ocean Researcher, and now conducts geophysical surveys. RRS Charles Darwin carried out 180 research cruises, worldwide, in her 21 years as a Natural Environment Research Council ship. The first cruise, in 1985, in the Northeast Atlantic, was led by Professor John Gould. 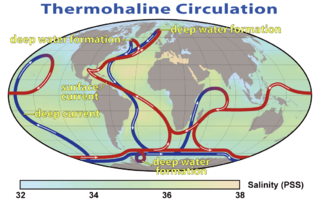 Researchers from the National Oceanography Centre, Southampton, studying climate change, have used RRS Charles Darwin to investigate the slowing of the Gulf Stream. Her final cruise was a geophysical survey for the British Geological Survey. The Charles Darwin in Fairlie, Scotland, at the end of a research cruise in August 2005. Loading for its last voyage as Charles Darwin, in March, 2006. ^ "Charles Darwin". Research Ship Schedules & Information. Retrieved 28 February 2010. ^ "Ocean Researcher". Sea Agent. Retrieved 28 February 2010. ^ "Charles Darwin". Ship Photos. Archived from the original on 29 August 2009. Retrieved 1 March 2010. ^ Freeman, R. B. (2007). "Charles Darwin: A companion". The Complete Work of Charles Darwin Online. Retrieved 28 February 2010. ^ "Ocean Researcher". Ships Nostalgia. Retrieved 28 February 2010. ^ "RRS Charles Darwin". The Inter-Agency Committee on Marine Science and Technology. Archived from the original on 9 October 2007. Retrieved 13 October 2007. ^ a b "Farewell to Royal Research Ship". NERC. 9 June 2006. Archived from the original on 27 September 2007. Retrieved 24 November 2007. ^ "Ocean Researcher". Gardline Geosurvey. Archived from the original on 3 March 2012. Retrieved 24 November 2007. The Scripps Institution of Oceanography in La Jolla, California, founded in 1903, is one of the oldest and largest centers for ocean and Earth science research, public service, undergraduate and graduate training in the world. Hundreds of ocean and Earth scientists conduct research with the aid of oceanographic research vessels and shorebased laboratories. Its Old Scripps Building is a U.S. National Historic Landmark. SIO is a division of the University of California San Diego (UCSD). The public explorations center of the institution is the Birch Aquarium at Scripps. Since becoming part of the University of California in 1912, the institution has expanded its scope to include studies of the physics, chemistry, geology, biology, and climate of Earth. RV Hugh R. Sharp is a research vessel owned and operated by the University of Delaware College of Earth, Ocean, and Environment in Lewes, Delaware operating as a member of the University-National Oceanographic Laboratory System (UNOLS). She is a replacement for Cape Henlopen. RV Atlantis is a sailboat that served as the first and also the main research vessel for the Woods Hole Oceanographic Institution from 1931 to 1964. Several ships, including RV Atlantis (AGOR-25) and the Space Shuttle Atlantis (OV-104) were named after Atlantis. The former Atlantis is now commissioned as an oceanographic research vessel in the Argentine Naval Prefecture as the Dr. Bernardo A. Houssay. Having sailed over 1,300,000 miles to date, she is the oldest serving oceanographic research vessel in the world. The research vessel Vema was a three-masted schooner of the Lamont Geological Observatory, a research unit of Columbia University. The 202 ft (62 m). waterline vessel, with her almost indestructible Swedish wrought iron hull, became renowned as one of the world’s most productive oceanographic research vessels. The ship had been first sailed for pleasure under the name Hussar, and after her career as a research vessel entered a new career as the cruising yacht Mandalay. RV Neil Armstrong (AGOR-27) is the designation for a new oceanographic research ship, first of the Neil Armstrong-class research vessels, to be owned by the United States Navy and operated by Woods Hole Oceanographic Institution. Secretary of the Navy Ray Mabus announced on September 24, 2012 that the research vessel was to be named after Neil Armstrong, the first person to walk on the Moon and a former naval aviator who served in the Korean War. NOAAS David Starr Jordan was an American fisheries research vessel that was in commission in the National Oceanic and Atmospheric Administration (NOAA) fleet from 1970 to 2010. Prior to her NOAA career, she was in the United States Fish and Wildlife Service's Bureau of Commercial Fisheries fleet from 1966 to 1970 as BCF David Starr Jordan. NOAAS George B. Kelez , previously NOAAS George B. Kelez , was an American research vessel in commission in the National Oceanic and Atmospheric Administration (NOAA) fleet from 1972 to 1980. Prior to her NOAA career, she operated under the United States Fish and Wildlife Service′s Bureau of Commercial Fisheries from 1962 to 1970 and the National Marine Fisheries Service from 1970 to 1972 as R/V George B. Kelez.